The abundance of metals, or metallicity, of objects throughout the universe, appears to have a considerable affect on the various properties of those objects. For instance, for Supernovae, the violent explosions that signify the deaths of massive stars, the metallicity of the progenitor star before it collapses to produce the explosion, plays a major role in the determination of what type of supernova the star will eventually become, and therefore, the amount of energy released in the explosion. However, in the exoplanet community, the metallicity of stars took on a whole new meaning in 1997 after the first three exoplanet hosts were studied. It was found that all three of these stars had a much higher fraction of metals by mass in their atmospheres than the Sun does. They were found to be so called, metal-rich stars. In the subsequent 19 years since this finding, astronomers have discovered that there is a direct correlation between the fraction of iron atoms in a star’s atmosphere and the probability of that star hosting a gas giant planet. In fact, it has been shown that for Sun-like stars with three times the metallicity of the Sun, around 30% have Jupiter-like giant planets orbiting them, whereas only 3% of stars with a mass similar to the Sun host these types of planets. 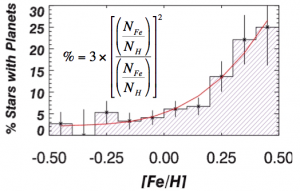 This lower fraction of gas giant planet-hosting stars with lower metallicity continues down to stars with even lower fractions of metals by mass, whereby only 0.3% of stars with one-tenth the metallicity of the Sun host giant planets. This relationship was the first direct connection between the properties of stars that astronomers can measure observationally, and their retinue of planets. It turns out that such a correlation as the one observed between gas giant planet fraction and stellar metallicity was a direct prediction of the core accretion planet formation process. At the time, the two competing formation channels for planets were core accretion and gravitational collapse. 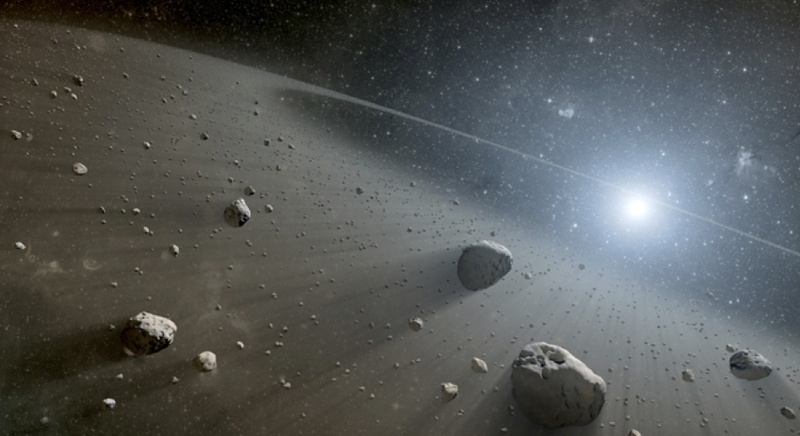 The core accretion formation process is a ‘bottom-up’ mechanism, where the smallest dust particles in the disc of material leftover from the formation of the star, begin to stick together, building up larger and larger pebbles, rocks, and finally planetesimals. The planetesimals can then go on and continue to grow, either by accreting more dusty material from the disc, or by sweeping up the disc’s reservoir of gas. On the other hand, the gravitation collapse channel is a ‘top-down’ mechanism, whereby the disc fragments into smaller pieces of dust and gas due to gravitationally unstable regions in the disc, and with continued collapse over time, those pieces finally become giant planetary bodies orbiting the central star. In either case, it’s humbling to remember that planet Earth, where life clings to so voraciously, was born out of the stellar garbage left over after the mother Sun was born. The percentage of stars hosting gas giant planets near to the host star with changing stellar metallicity ([Fe/H]). It can be seen that the stars with the most amount of metals in their atmospheres have a higher chance of growing a giant planet around them. The red curve shows the best-fit model to the data (coloured region) and the equation that describes the model is represented on plot. As discussed in the text, the percentage of stars hosting giant planets increases with the fraction of iron (Fe) over hydrogen (H) in a star’s atmosphere. Credit: Graphic modified from the original published by Fischer & Valenti 2005, ApJ. Both these mechanisms make key testable predictions, and the fraction of gas giant planets orbiting stars as a function of metallicity was one that came to very different conclusions. Given that the core accretion model starts by sticking the smallest dust particles together to make larger structures, the more dust in the disc, the faster those structures can be built, and the faster those cores can acquire gas from the disc before the disc is lost to interstellar space. Given that the disc is leftover rubbish from the formation of the central star, discs rich in dust should also have formed stars rich in metals, or those with higher metallicities, seemingly in agreement with observations. On the other hand, the gravitational collapse model does not depend on the dust fraction in the disc and so less dusty discs should form as many large planets as dusty discs do, meaning no stellar metallicity bias should be witnessed. In the end, this was the key piece of evidence to suggest that planets are formed through a bottom-up process like core accretion. With the recent advancement in technology in the laboratory, along with the latest data being fed to astronomers from orbiting space telescopes like Kepler, the picture may not be as clear cut for the population of lower-mass planets, particularly planets with masses similar to that of Neptune or less. It appears that the fraction of stars hosting these low-mass planets, aka. super-Earths, does not increase with increasing metallicity, in the same way as for giant planets. In fact, the opposite might be true, where low-mass planets tend to form predominantly around metal-poor stars. If the population of super-Earth planets do not follow the same pattern as giant planets, then what does this say about how these planets form? Does this mean they do not form through the same core accretion-type process as giant planets? Well the answer is no, it does not mean that. Remember that core accretion predicts that giant planets will be predominantly found orbiting metal-rich stars because the small cores that grow to become the large planetesimals that are needed to tear the gas away from disc must grow fast enough before the disc is lost. However, low-mass planets that are either core dominated or that don’t require significant amounts of gas have no need to form so quickly. In an environment where there is less metals, cores take longer to form, and therefore they maintain a small mass up until the disc is lost. Therefore, core accretion also predicts that low-mass planets should be more abundant orbiting metal-poor stars than gas giant planets, another win for the core accretion planet formation theory!! Metallicity of planet host stars against the minimum mass of the detected planets in those systems. Note that this is only for stars hosting planets with estimated masses in agreement with the mass of Neptune or less. 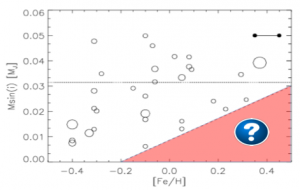 The red shaded region is the super metal-rich part of the diagram and it appears to show a lack of planets when compared to the more metal-poor region in the left bottom quadrant of the plot. Credit: Graphic modified from our paper discussing this observational result. The role that metals have played in the development of the evolving universe and for the emergence of life on planet Earth cannot be understated. Metals are the weaving that so intimately connects us all to the entire cosmos around us. Its ironic that such beauty emerges from such violent beginnings out there in space. As for Proxima Centauri, it is a super metal-rich star, meaning its small proto-planetary disc would have been rich in planet forming material. This at least gives us hope that some of those metals began the chaotic dance that ends with the birth of new planets, and who knows, with such a rich array of metals that could have been there in those early days, are there other life forms on those planets that have been fortunate enough to make use of the universe’s talent for metal production? Maybe the Pale Red Dot project will help us to find out!! About the Author. 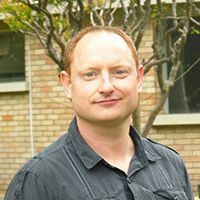 James Jenkins is an assistant professor at the Universidad de Chile based in Santiago, the capital city of Chile. Nestled between the surrounding Andes mountain range atop Cerro Calan, he performs observations of nearby stars to hunt out and better understand extrasolar planets and their host stars. James received his Ph.D from the University of Hertfordshire in 2007, going on to hold a postdoctoral position at Pennsylvania State University, working on the Precision Radial Velocity Spectrograph. At the end of 2008 he found himself working at the Universidad de Chile as a postdoctoral researcher and then as a Fondecyt Fellow between 2010-2013, joining the faculty at the end of 2013. 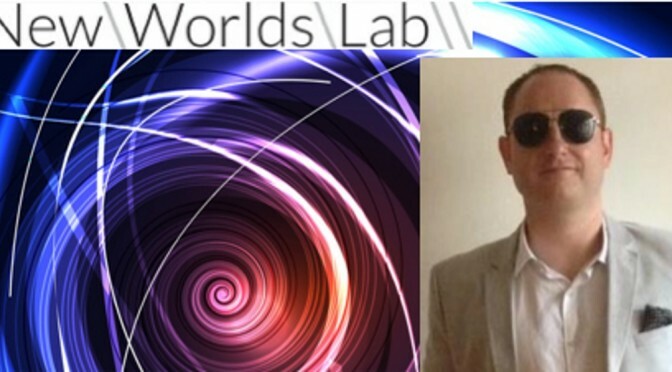 His main research interests include the discovery of planets orbiting metal-rich stars through the Calan-Hertfordshire Extrasolar Planet Search, the search for very low-mass planets in radial velocity data, and planets orbiting giant stars. For his sins, he also studies the magnetic activity of planet host stars, working to better understand how this source of ‘noise’ can be filtered out of planet search data. James is a very active member in the Pale Red Dot project and is one of the editors of palereddot.org. The Big Bang is the name given to our current model for the moment of creation of the Universe. The word ‘exoplanet’ is the disminuative of the words ‘extra-solar planet’, worlds orbiting stars other than the Sun. Remember that the radial velocity detection method does not give the absolute mass of stellar companions, but instead gives us the ‘minimum mass’, since the inclination of the system to our line of sight is unknown.